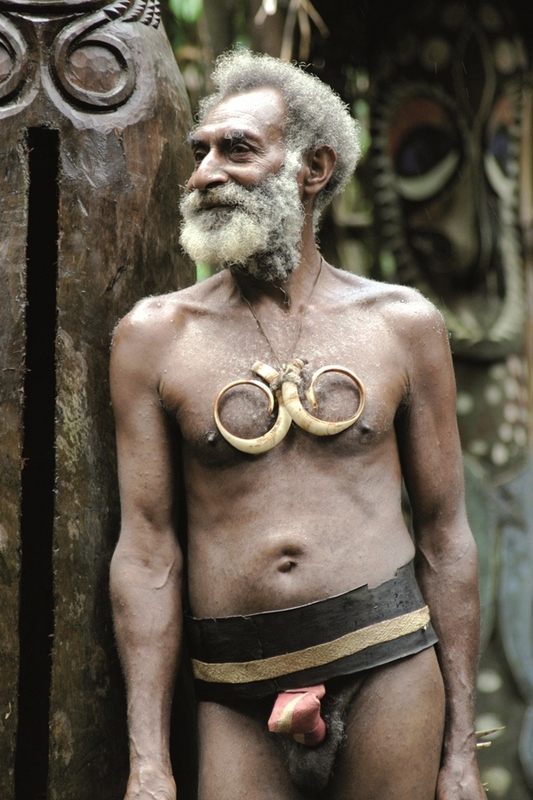 Vanuatu is, above all, its people. They may be any of the uncounted tribes and be speaking any one of its 81 living languages, but they are all united in offering visitors a warm welcome springing from a very real pride in their land and their country. 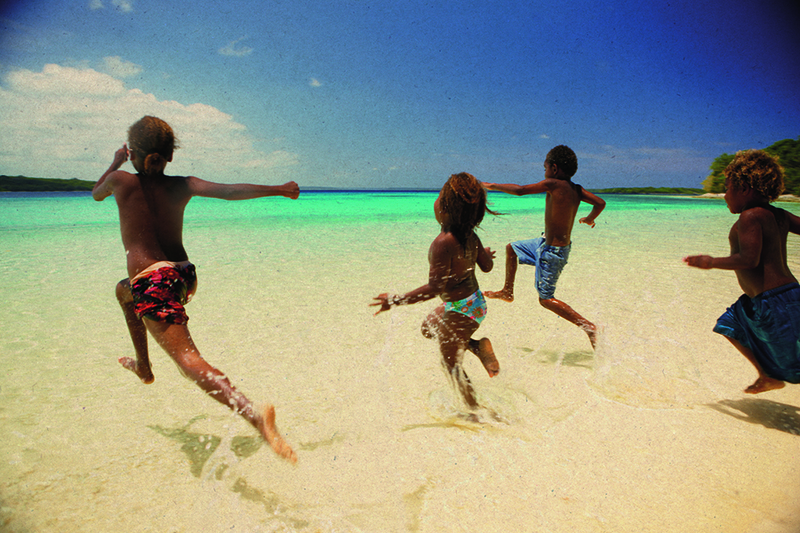 VANUATU, formerly known as the New Hebrides, used to be known to the western world principally for two unique features: The “Land-diving” ceremonies of Pentecost Island and its unique “Condominium” form of colonial rule under which the British and the French shared power, each administering their own nationals and both largely leaving the local population to get on with things as they wished. Independence in 1980 swept away the Condominium while many other top class attractions have joined land-diving on the world’s “Must See / Must Do” lists. 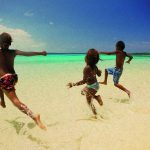 It is very important for visitors to understand that the people of Vanuatu have a complex and sophisticated relationship with the land and the sea that is quite different from the west. This means someone, somewhere has traditional rights over everything, including the sea, and the visitor does well to ask for permission to walk on the land, to anchor in the bay or to fish on the reef. Normally this permission should be obtained from the local chief but it is not unusual for several individuals or groups to have conflicting claims, especially if they see the possibility of “presents” from visiting yachts. For yachts making the traditional east to west around-the-world cruise and arriving from Fiji in the east or New Zealand in the southeast, the initial decision has to be the choice of landfall. Tanna, at the southern end of the island chain, with its spectacular volcano or Port Vila, the capital, on Efate. Many chose to arrive at Port Vila and then fly down to Tanna. The passage from Port Vila to Tanna is not to be undertaken lightly if the southeast trades are blowing. 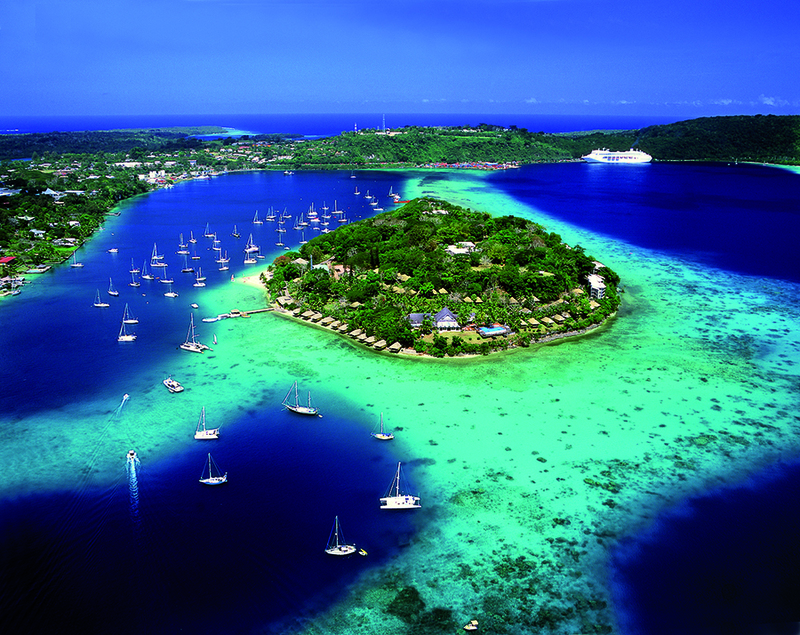 It must be understood from the outset that Port Vila is not representative of Vanuatu. Its level of sophistication and modernity stands in stark contrast to the rest of the country. Here there are shops full of imported goods, hotels, restaurants, bars and clubs that would not be out of place in the Eastern Caribbean or Tahiti. Services for yachting are limited at present but there are artisans skilled in many trades who can carry out a surprising range of repairs. There are no berths for superyachts in Port Vila although there is talk of new facilities to be built along the waterfront. This lack of berths is not a problem because the bay is well sheltered although it can get rough when, very occasionally, the wind goes into the west. Anchorage may be found in the area lying between the leading line and the reef that closes off the northern part of the bay. Take care not to obstruct the navigation channel because, from time to time, a small tanker comes right in close to land in order to follow the channel east of Iririki Island and into Paray Bay. Superyachts can berth temporarily at the commercial wharf in the southwest corner of the bay for bunkering. The shopping in Port Vila is excellent with a wide range of imported foods at Au Bon Marché and other specialist shops. The central market, right on the waterfront, offers a range of local produce and should not be missed. Our crew enjoyed Numbawan Café (right on the water, with free Wi-Fi) and The Waterfront, the original yachtie bar-restaurant, as well as some less salubrious late-night dives in the town. 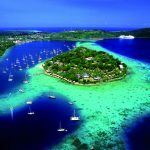 The islands of the central part of Vanuatu form a rough ‘Y’ shape with Efate just below the fork so cruisers wishing to return to Port Vila have the option of a circular tour that does not involve much double tracking. This is a clockwise tour of the central area with a detour to the Banks Islands. Havana Harbour, not a harbour at all but an extensive sheltered anchorage on the west coast of Efate, is popular as a first stop after Port Vila. From here a day’s sail will take you to Lamen Bay, a popular anchorage on the northwest coast of Epi. We had some excellent fishing, with our local guide, Douglas, just outside the bay. From Lamen Bay a short downwind passage will take you to the Maskelyne Islands at the southern end of Malekula. This group of small islands and reefs offers a number of delightful anchorages but be prepared for constant approaches from locals with things to sell or services to offer. One man brought us a small outboard motor which was seized solid as a result of being drowned many months previously and asked if we could fix it. Crab Bay on the northeast coast of Malekula turned out to be one of our favourite anchorages. The entrance is easy, even in poor light; the water is shallow enough and the holding good; the scenery is not spectacular but there is a nice beach and the snorkelling on the reef is superb, with lots of turtles. We did not like the recommended anchorage at Wala Island, off northeast Malekula, because it is visited by cruise ships and this has changed the attitude of the local people. The town of Luganville, on Espiritu Santo, is the country’s second, and indeed only, other town. It’s ambience is completely different from that of Port Vila and, we thought, more in keeping with the country. It is not much more than a single long street fronted by shops and government buildings but, with persistence, a remarkable range of supplies can be found. We even managed to have a failed hydraulic hose copied by a local workshop. The locally produced beef is superb and whole fillets (unfortunately, fresh – not aged) can be bought very cheaply. Apart from the chance to re-provision, Luganville offers the opportunity to dive the wreck of the President Coolidge, said to be the largest diveable wreck in the world. The diving is sufficiently dangerous that independent divers are not allowed: you have to go with one of the three local dive operators. During WWII Vanuatu, and especially, Santo was an important staging post for allied troops, mostly American, desperately trying to stop the Japanese advance down through the Solomons. Santo’s Second Channel was an ideal fleet anchorage and the President Coolidge, a troopship, sank after hitting mines lain to protect the anchorage. It is said there were more than half a million foreign troops stationed on the island at that time. One of them was James Mitchener who used his wartime experiences as the basis for his first novel, South Pacific, which became a hugely successful musical and launched his long and productive career as a writer. Most yachts visiting Luganville choose to anchor on the southern side of the channel, close to Aore Island, because the surroundings there are much more attractive, but we had difficulty finding a spot shallow enough to anchor that was not too close to the shore. The waterfront of Luganville has not been developed and there is no convenient place to leave a tender. Even landing there is not easy. The east coast of Santo offers a number of possible anchorages. We chose to go to Hog Harbour, adjacent to the famous Champagne Beach which, unfortunately, is no longer recommended as an anchorage because of a dispute between local groups over rights. From Hog Harbour we sailed north into the Banks Islands, to Gaua (aka Santa Maria) where we first took the guests and crew ashore at Kwetevat Bay for the traditional “Water Music” performed by women from the village. The main settlement on Guau is at Lesalav (or Losalava) on the northeast of the island where, with care and good light you can work your way in through the reef and anchor close to the village. There is nothing special about the village and this was the interest for us: a chance to visit a typical island village and, thanks to a French-speaking school teacher, hear about everyday life there. Next north is Vanua Lava with its Twin Waterfalls on the west coast. The waterfalls bring a steady stream of visitors and the chief has built a yacht club to welcome them. Here he gave us a lengthy speech which was followed by a welcome song set to the tune of God Save the Queen. North again lies Ureparapara, a most remarkable anchorage in the centre of a volcanic crater that has been breached by the sea. The fishing outside the entrance is very good and we quickly caught some Dogtooth and Yellowfin Tuna. Northwest of Ureparapara lie the Torres Islands where, we were told, the culture starts to show a significant Melanesian influence from the Solomon Islands further north. We did not, unfortunately, have time to visit them. The return leg of the circuit from Port Vila takes you next to Maewo, a long thin island across from Santo. Halfway down the west coast are the “Big Water Cascades” which are well worth a visit. Local guides escorted us up the very slippery path between taro patches to the pool at the foot of the cascade where we swam in the clear cool water. 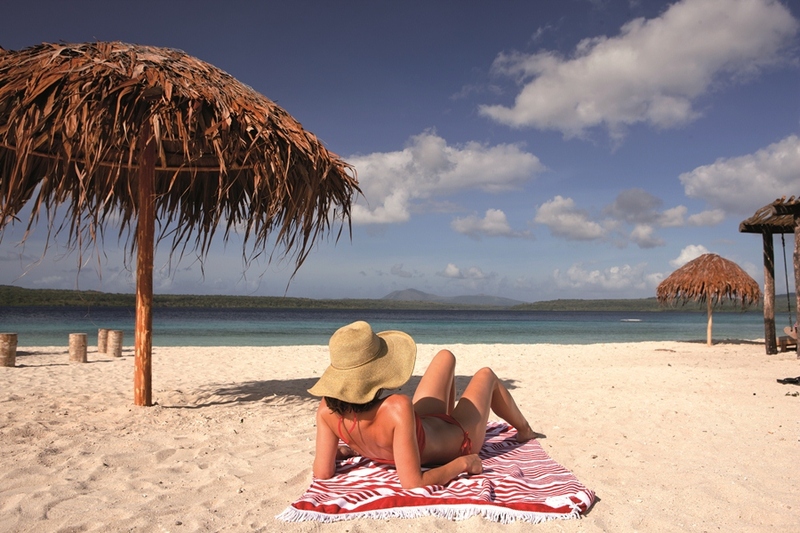 At the southern end of Maewo lies Asanvari Bay, perhaps, in cruising circles, the most famous of Vanuatu’s anchorages. Here Chief Nelson has built a “Yacht Club” and organises kastom dances, pig roasts and walking excursions. The diving around the coral pinnacle on the southwest side of the bay is excellent. The fishing here is good and, on the way in, we caught a Yellowfin Tuna of almost 60kg which provided plenty of fish for the other yachts in the anchorage and the locals ashore. The next island south is Pentecost, famous for its land-diving ceremonies which take place in the early part of the year and were, unfortunately, long since over when we got there. South again lies Ambrym with its two active volcanoes. Ambrym is also considered to be the country’s centre of magic and sorcery and its not hard to see how this arose as a result of the periodic devastation caused by these volcanoes. The northwestern part of the island is home to the marvellous Rom Dance. We anchored off Ranon at the time of the August “Back to my Roots” festival and arranged to see a Rom Dance at Fanla, about an hour’s walk into the interior. Our circular tour now takes us back to Epi and then south again to Efate. Squall cruised the central parts of Vanuatu in July and August 2008 and we barely scratched the surface. Those two months left all of us with a kaleidoscope of vivid memories and we would go back at once if given the opportunity. 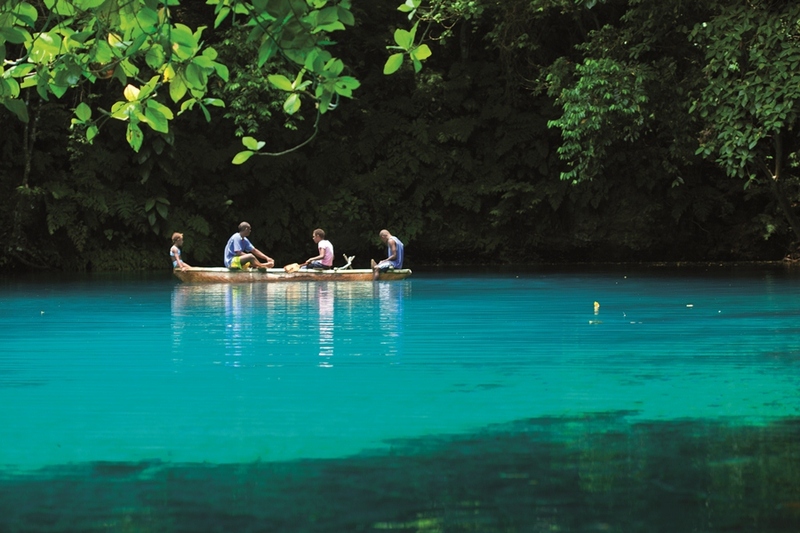 Vanuatu is a country on the brink of massive change. The week before we arrived saw the switch-on of the first country-wide mobile phone service and already the effects were visible: people without electricity, running water or roads were buying mobile phones and the solar chargers supplied with them. It seems to me highly probable that the combination of the spreading cash economy, better communications and easier travel will quickly lead to “homogenisation” of the culture that will sadly, diminish the things that make Vanuatu so distinctive and so interesting.